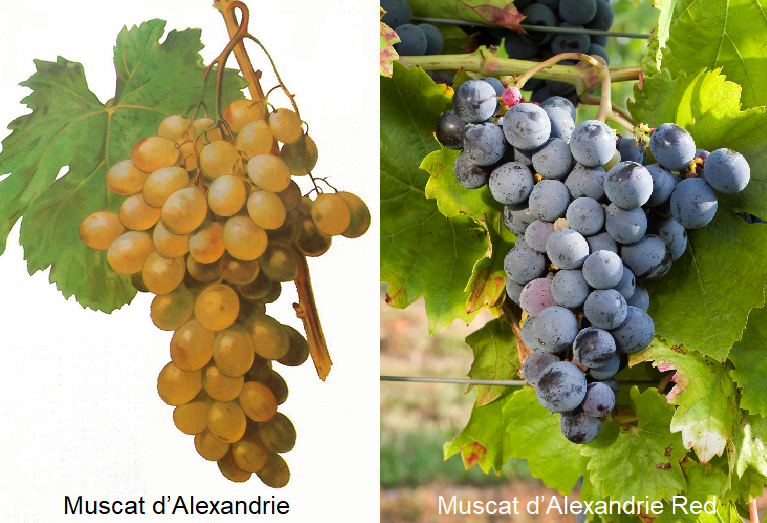 Synonym (also Tamîioasa de Alexandria) for the grape variety Muscat d'Alexandrie; look there. The white grape comes from the Mediterranean area; possibly from Greece or Italy. Around 200 Synonyms testify to the high age and worldwide distribution of the vine. The most important alphabetically grouped by country are Muscat de Berkain, Muscat de Fandouk, Muscat El Adda ( Algeria ); Moscatel Bianco, Moscatel Blanco, Moscatel de Alejandría, ( Argentina ); Gordo, Lexia, Muscat Gordo Blanco, Muscat of Alexandria ( Australia ); Moscatel de Alejandría ( Chile ); Cibeben Muskateller, Muscat-Damascene, White Spaniard, White Zibeben Muscateller, Zibeben Muskateller ( Germany ); Acherfield's Early Nutmeg, Muscat Bowood ( England ); Augibi Blanc, Jubi Blanc, Muscat à Gros Grains, Muscat d'Alexandrie Blanc, Muscat de Jerusalem, Muscat de Rome, Muscat d'Espagne, Muscat Grec, Muscat Romain ( France ), Angliko, Apostoliatiko, Moschato Alexandria, Moschato Limnou ( Greece ); Gerosolimitana Bianca, Gordo Zibibo, Gorosolimitana Bianca, Isidore, Moscatel d'Alessandria, Moscatel de Jesus, Moscatel Romano, Moscatellone, Moscato di Pantelleria, Moscato Francese, Moscato Gordo, Paradisia, Seralamanna, Uva di Pantelleria, Zibibbo, Zibibbo de Pantellaria, Zibibo ( Italy ); Cibib, Cibib Muscatan Bijeli ( Croatia ); Moscatel de Setúbal, Moscatel Graúdo ( Portugal ), Tamíioasa de Alexandria ( Romania ); Aleksandrian Muscat ( Russia ); Gordo, Moscatel Blanco, Moscatel de Alejandría, Moscatel de Málaga, Moscato de Chipiona, Moscato de Grano Gordo, Moscatel de Malaga, Moscatel Flamenco, Moscatel Gordo, Moscatel Gordo Blanco, Moscatel Gordo Morado, Salamanca, Zibibbo Blanco ( Spain ); Hanepoot, Roode Hanepoot, White Muscat of Alexandria, White Hanepoot ( South Africa ); Meski, Albillo di Toro, Argelino, Muscat de Raf-Raf ( Tunisia ), Iskendiriye Misketi ( Turkey ); Alexandriai Muskotály, Daroczy Musko ( Hungary ); Málaga ( Cyprus ). This page was last modified at 26 May 2013 at 13:56.